St. Louis Blues' Colton Parayko (55) and Edmonton Oilers' Leon Draisaitl (29) battle for the puck during second period NHL action in Edmonton on Dec. 18, 2018. When Leon Draisaitl’s teammates are asked about him, smiles creep across their faces. Not about the guy who tears up the ice as Connor McDavid’s frequent linemate, but about the fellow behind the doors in the Oilers dressing room. Draisaitl is direct, polite, and engages little in small talk. Surrounded by his friends, however, another layer emerges. “When he is your teammate and friend, you get to know him,” says Cam Talbot, the Oilers goalie. “He comes up with some quick-witted lines. Propelled by dry wit inside the Oilers dressing room, on the ice Draisaitl is soft-handed, focused and workmanlike. He is 23 and on a pace to score 100 points this season. That has largely gone unnoticed because he plays in the shadow of superstar McDavid, and because he isn’t flashy. Draisaitl doesn’t dance on the ice before games like P.K. Subban. He is unlikely to go on a celebratory bender like Alex Ovechkin. He shows up. He does his job. Quite well. “He is task-oriented, so if you give him a specific role, he grabs it and runs with it,” says Ken Hitchcock, the Edmonton coach. He was one of the final four players chosen this week for the NHL all-star game − likely because McDavid urged his 340,000 followers on Twitter to vote for him as part of a “Last Man Leon” campaign. “It is cool to be part of something like that and to be around the best players in the world,” Draisaitl says. “Fans played the main role, so I have to thank them more than anyone. Next weekend, he will become only the fourth player from Germany to participate in the all-star game, and will likely soon set an NHL record for goals in a season by a German player. He has 24 with 35 games remaining. Draisaitl scored 29 in 2016-17, the last time the Oilers reached the playoffs. Back home in Cologne, where his father, Peter, coaches the Sharks of the Deutsche Eishockey League, Draisaitl is known as the “German Gretzky.” He joins retired Formula One driver Michael Schumacher, Arsenal midfielder Mesut Ozil, basketball’s Dirk Nowitzki and retired tennis great Steffi Graf as among the most popular athletes in the country. Draisaitl was chosen third by the Oilers in the 2014 draft, higher than any other German in history. He has put together back-to-back seasons of 77 and 70 points, and has 56 through 47 games this year – more than Ovechkin, Steven Stamkos, John Tavares and Evgeni Malkin, among others. Draisaitl has worked hard to develop his talent, but it didn’t hurt that his dad was a great athlete, too. Peter Draisaitl played for Germany in three Olympic Games, numerous world championships and at the 1996 World Cup of Hockey. The Germans lost in the quarter-finals that year to Canada, 4-1, in Montreal. A centre, Draisaitl took faceoffs against Wayne Gretzky and lined up against Mark Messier and Paul Coffey. He had five points in the tournament, same as Messier and Teemu Selanne. The father and coach began to realize that his offspring had special skills when Leon was in his early teens. At 16, his son was the second player selected in the Canadian Hockey League’s import draft, and, two years later, was the most valuable player at the Memorial Cup as a member of the Kelowna Rockets of the Western Hockey League. The Draisaitl family travelled together to Philadelphia in June, 2014, to see Leon drafted by the Oilers, and his mother, Sandra, and younger sister, Kim, a production assistant for a German television company, hope to attend the all-star game in San Jose. Peter is unable go because the Cologne Sharks are in the middle of the season. Peter watches as many of Edmonton’s games on television as he can, and scans boxscores the next morning to see if Leon scored. Leon has improved steadily with the Oilers and is currently in the second season of an eight-year contract worth US$68-million. Last fall, he quietly committed to donate $1.2-million to Hockey Helps Kids, a children’s charity in Edmonton started by Harrison and Chloe Katz, the teenage twins whose dad, Daryl, owns the team. 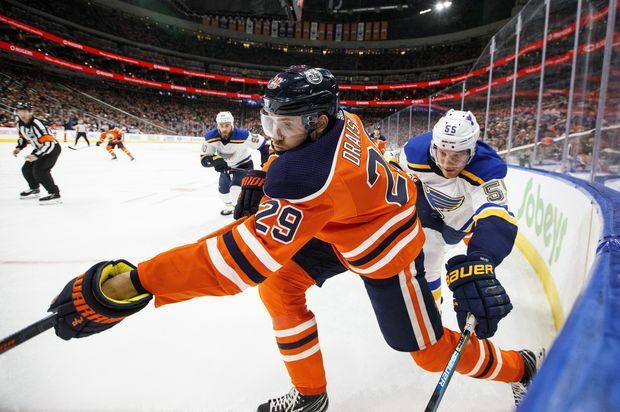 As part of the initiative that encourages students to volunteer, Draisaitl joined kids in packing groceries last year for the Edmonton Food Bank and has worked with them to raise money for adults and children suffering from mental-health issues. Despite his success, Draisaitl remains unaffected, unassuming, and quiet around everyone but his teammates. “He is like a brother to me,” says Nurse, Edmonton’s lanky defenceman, who is known on the team for his culinary expertise and occasionally prepares dinner for Draisiatl. Nurse listens and laughs uproariously. “Leon has a different sense of humour,” Zack Kassian says. “It is unique to have a guy on a team that puts in the hard work and is also so fun to be around.